The North Carolina Courage scored in the game’s final moments to tie Seattle Reign FC 1-1 on the road on Saturday afternoon. Lynn Williams’ goal following a mad scramble in the box improves the Courage to 16-1-6 on the season. They now have 54 points, which ties the league record set by Seattle Reign FC in 2014. It was the final road game of the regular season for the Courage, and they finish unbeaten on the road (8-0-4). The Reign could’ve clinched the No. 2 seed with a win, but will now have to wait for the rest of the day’s results to see if they can clinch that spot. They are now 11-4-8 (41 points). The game-tying goal came in the 95th minute. On a Courage corner kick deep in stoppage time, Kristen Hamilton’s header was saved by Reign goalkeeper Lydia Williams. Sam Mewis’ follow-up header was blocked by Lauren Barnes. Then it was McCall Zerboni’s turn, but her shot was blocked by Jess Fishlock. The ball bounced into the path of Lynn Williams, with Elizabeth Addo on the ground making the first stop, but Williams persisted and hit it off the post and over the line. Williams now has 12 goals on the season, tied for the league lead. The Courage were awarded the corner kick after a Mewis header went over the bar, but was ruled pushed out for a corner. Minutes earlier, with the Reign holding a 1-0 lead, a cross from Addo hit the hand of Courage defender Abby Dahlkemper in the box, but no penalty was called by referee Ramy Touchan. After a scoreless first half, Seattle took the lead on a goal by Jodie Taylor, her 10th of the season. Taylor took a shot that looked to be going wide, but Courage goalkeeper Katelyn Rowland dove for it and got a hand on it, pushing it out for a corner kick. Fishlock took the corner kick, sending it all the way across the field and just outside the penalty box. Reign defender Theresa Nielsen headed it back in and right in the mix. Taylor, as well as Rowland, went up for the ball, but it missed everyone and bounced into the net. Nielsen also came up on the defensive end with a save off the line in the 88th minute on a header by Erceg. Reign goalkeeper Lydia Williams made 11 saves in the match, with many of her best coming vs. Jessica McDonald. In the 27th minute, Williams pushed aside a point-blank header from McDonald. She also made a stop on McDonald in the 14th minute. Also, in the 59th minute, she stopped McDonald with a diving save — though Williams was ruled offside on the play. The result kept both teams from setting an NWSL record. The Courage were searching for win No. 17, which would’ve been a new record for the NWSL — which would’ve surpassed record set by the 2014 Reign and 2016 Courage. And the Reign were one minute away from setting a new NWSL record with their 13th shutout — which would’ve broken the 2017 Courage’s record of 12. Courage left back Jaelene Hinkle missed the game with a left ankle sprain, and Crystal Dunn started in her place at left back before moving into the midfield in the second half. 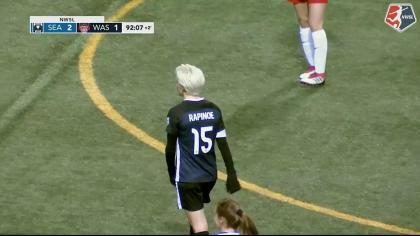 Reign forward Megan Rapinoe was a late scratch with a rib injury. The Reign will next be in action on September 7, on the road vs. Portland Thorns FC. The Courage host the Dash in the final game of the NWSL regular season on September 8. Match ends, Seattle Reign 1, North Carolina Courage 1. Second Half ends, Seattle Reign 1, North Carolina Courage 1. Goal! Seattle Reign 1, North Carolina Courage 1. Lynn Williams (North Carolina Courage) right footed shot from very close range to the top right corner following a corner. Attempt blocked. McCall Zerboni (North Carolina Courage) right footed shot from very close range is blocked. Attempt blocked. Samantha Mewis (North Carolina Courage) header from very close range is blocked. Attempt saved. Kristen Hamilton (North Carolina Courage) header from the right side of the six yard box is saved in the centre of the goal. Assisted by Abby Erceg with a headed pass. Corner, North Carolina Courage. Conceded by Christen Westphal. Attempt saved. Samantha Mewis (North Carolina Courage) header from very close range is saved in the top centre of the goal. Assisted by Debinha with a cross. Corner, Seattle Reign. Conceded by Heather O'Reilly. Attempt missed. Abby Dahlkemper (North Carolina Courage) left footed shot from outside the box is close, but misses to the right following a corner. Attempt blocked. Kristen Hamilton (North Carolina Courage) left footed shot from the right side of the box is blocked. Attempt blocked. Samantha Mewis (North Carolina Courage) left footed shot from outside the box is blocked. Attempt missed. Crystal Dunn (North Carolina Courage) header from the centre of the box misses to the right. Assisted by Lynn Williams with a cross. Substitution, North Carolina Courage. Kristen Hamilton replaces Jessica McDonald. Jodie Taylor (Seattle Reign) is shown the yellow card. Substitution, North Carolina Courage. Heather O'Reilly replaces Denise O'Sullivan. Goal! Seattle Reign 1, North Carolina Courage 0. 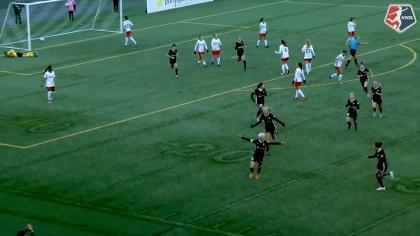 Theresa Nielsen (Seattle Reign) header from outside the box to the bottom left corner. Assisted by Jessica Fishlock with a cross following a corner. Attempt saved. Jodie Taylor (Seattle Reign) left footed shot from the left side of the box is saved in the bottom left corner. Hand ball by Lauren Barnes (Seattle Reign). Attempt saved. Jessica McDonald (North Carolina Courage) left footed shot from outside the box is saved in the bottom left corner. Assisted by Samantha Mewis. Attempt saved. Lynn Williams (North Carolina Courage) header from the centre of the box is saved in the centre of the goal. Assisted by Merritt Mathias. Attempt saved. Samantha Mewis (North Carolina Courage) left footed shot from outside the box is saved in the bottom left corner. Assisted by Denise O'Sullivan. Offside, Seattle Reign. Morgan Andrews tries a through ball, but Jasmyne Spencer is caught offside. Attempt missed. Lynn Williams (North Carolina Courage) header from the left side of the box is close, but misses to the left. Assisted by Abby Dahlkemper with a cross. Second Half begins Seattle Reign 0, North Carolina Courage 0. First Half ends, Seattle Reign 0, North Carolina Courage 0. Denise O'Sullivan (North Carolina Courage) is shown the yellow card. McCall Zerboni (North Carolina Courage) wins a free kick on the left wing. Theresa Nielsen (Seattle Reign) wins a free kick on the right wing. Attempt saved. Samantha Mewis (North Carolina Courage) right footed shot from outside the box is saved in the centre of the goal. Assisted by Jessica McDonald. Attempt saved. Samantha Mewis (North Carolina Courage) right footed shot from the left side of the six yard box is saved in the centre of the goal. Assisted by Abby Erceg. Attempt blocked. Abby Erceg (North Carolina Courage) header from the centre of the box is blocked. Assisted by Abby Dahlkemper with a cross. Attempt blocked. Debinha (North Carolina Courage) right footed shot from a difficult angle on the right is blocked. Attempt saved. Lynn Williams (North Carolina Courage) right footed shot from the centre of the box is saved in the centre of the goal. Assisted by Merritt Mathias with a cross. Attempt saved. Jessica McDonald (North Carolina Courage) header from the centre of the box is saved in the centre of the goal. Assisted by Merritt Mathias with a cross. Attempt missed. Crystal Dunn (North Carolina Courage) right footed shot from the left side of the box is too high. Jessica McDonald (North Carolina Courage) is shown the yellow card. Corner, Seattle Reign. Conceded by Crystal Dunn. Attempt blocked. Jasmyne Spencer (Seattle Reign) right footed shot from the left side of the box is blocked. Assisted by Kristen McNabb. Attempt saved. Jessica McDonald (North Carolina Courage) right footed shot from the centre of the box is saved in the centre of the goal. Assisted by Crystal Dunn. Attempt missed. Debinha (North Carolina Courage) left footed shot from the left side of the box is close, but misses to the left. Attempt blocked. Abby Erceg (North Carolina Courage) header from the centre of the box is blocked. Assisted by McCall Zerboni with a cross. Corner, North Carolina Courage. Conceded by Lydia Williams. Attempt saved. Merritt Mathias (North Carolina Courage) left footed shot from outside the box is saved in the bottom right corner. Assisted by Denise O'Sullivan. Attempt missed. Lynn Williams (North Carolina Courage) header from very close range misses to the left. Assisted by Denise O'Sullivan with a cross. Attempt blocked. Morgan Andrews (Seattle Reign) left footed shot from outside the box is blocked. Assisted by Jessica Fishlock. Attempt saved. Lauren Barnes (Seattle Reign) header from the centre of the box is saved in the bottom left corner. Assisted by Stephanie Catley with a cross. Attempt blocked. Theresa Nielsen (Seattle Reign) left footed shot from the centre of the box is blocked.